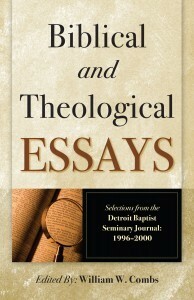 Biblical and Theological Essays, a selection of articles from the first five years of the theological journal published by Detroit Baptist Theological Seminary, has just been released by BMH Books of Winona Lake, Ind., and is now available for shipping. The 428-page paperback is edited by Dr. William Combs, academic dean and professor of New Testament at the seminary. Most of the authors are Th.D. graduates of Grace Theological Seminary. Authors include Combs, Robert V. McCabe, Rolland D. McCune, David Doran, and others. The first section of the book, Textual Studies, includes articles on the preservation of scripture and Erasmus and the Textus Receptus. The second section, Biblical and Theological Studies, contains a range of article on individual books of the Bible as well as discussions of the believer’s nature, the meaning of “born of water and the spirit,” implications of the pre-Mosaic tithe, a defense of literal days in the creation week, and more. The Historical Studies segment features articles on the self-identity of fundamentalism, an analysis of the William Jennings Bryan Scopes Trial, and other issues. The final section, Ministry Studies, includes material on the role of the Holy Spirit in preaching and a historical and doctrinal evaluation of revival and revivalism. The book is liberally documented with footnotes and original Greek and Hebrew as well as an extensive Scripture index. The book’s ISBN number is 978-0-88469-263-8 and it retails for $24.99. It is available at www.bmhbooks.com, or from online booksellers and Christian bookstores.